BBC - Culture - ‘Paul is dead’: A Beatles secret message in an album cover?. Beatles Radio: The Beatles, Solos, Covers, Birthdays, News The Fab 4 and More! BBC - Culture - ‘Paul is dead’: A Beatles secret message in an album cover? There’s a crazy rumour that’s persisted for over 50 years that Paul McCartney actually died in a car crash in 1966 and was replaced with a lookalike imposter. It was so well-known that Life magazine referred to it in the title – Paul is still with us – of a 1969 cover story about the musician. 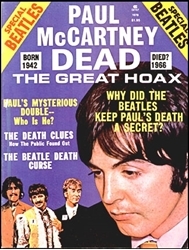 McCartney himself referenced the ‘Paul is dead’ myth on his 1993 album Paul Is Live. He also parodied the iconic album art of Abbey Road, which conspiracy theorists alleged contained clues suggesting McCartney’s replacement with a dead ringer.